A Delaware County family was one of five families honored by the Ohio Department of Agriculture at the Farm Science Review in London. Jim and Denise Sherman were presented with a 2017 Conservation Farm Family Award after being selected as the winner for Area 5. The Shermans farm 700 acres in Delaware and Morrow counties for the production of soybeans, corn, wheat and hay, plus pasture and woodlands. The farm includes a 22 head cow-calf herd and 177 acres have been accepted for the Local Agricultural Easement Purchase Program under the Ohio Department of Agriculture. The Sherman’s farm is also registered as a Century Farm with the Ohio Department of Agriculture’s Ohio Historic Family Farm program. Jim was a founding member of the Upper Big Creek Water Quality Partnership. Since 2004, USDA’s Agricultural Research Service has been collecting water samples from drains on the farm as part of a long term study on water quality. In 2016, OSU researchers installed a woodchip bioreactor on the property. The Sherman family has cooperated with Delaware SWCD for over 41 years and in 2012 the family was named Outstanding cooperator of the year with the Delaware Soil and Water Conservation District. The other four families honored were the Rufenacht Family of Fulton County; Dale and Rita Daniels of Erie County; Wendell and Greg Waters of Coshocton County; and Greg and Gary McGlinch of Darke County. Since 1984, the Conservation Farm Family Awards program has recognized 176 Ohio farm families for their exemplary efforts conserving soil, water, woodland, wildlife and other natural resources on the land they farm. Conservation farm families also host a variety of educational programs, opening their farms to schools, scout groups, farm organizations and others. In addition to receiving $400 each from the Ohio Farm Bureau Federation, the families were also featured in the September issue of Ohio Farmer magazine and received plaques from ADS Hancor Inc. Ohio Farmer magazine has sponsored the Ohio Conservation Farm Family Awards since the program’s inception. Nominations are sought annually between January and May, and Ohio farming families are encouraged to apply. For more information or to apply individuals can contact their local Soil and Water Conservation District. The Ohio Department of Agriculture recognized five Conservation Farm Family Awards winners at Farm Science Review. 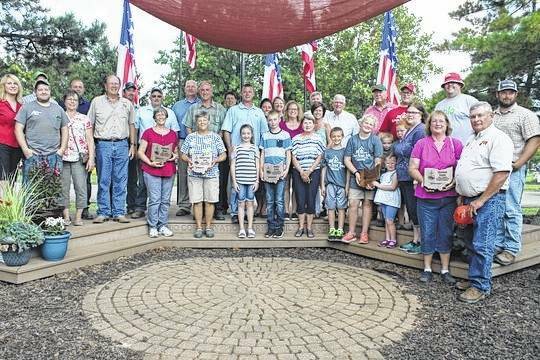 Plaque winners, front row, left to right, Area 1 winner Rufenacht Family, Area 2 winner Daniels Family, Area 3 winner Waters Family, Area 4 winner McGlinch Family, Area 5 winner Sherman Family of Delaware County.